Not many people are aware that during the WWI, artists all over Britain, also aided the army in their own way. 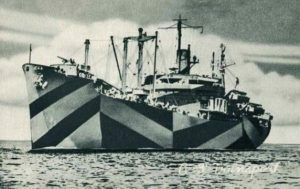 Dazzle, a style of ship camouflage characterised by brilliant, glaring geometric patterns, which was developed by the British marine artist Norman Wilkinson, and widely used in the First and Second World Wars. “Dazzle” does not strive to make a ship invisible to its enemies, but rather to confuse their attempts to sink it by making it difficult to accurately calculate the distance, direction and speed at which it is travelling. It is unknown whether this helped lower the numbers of the losses of the British navy, but it is fact that the military used the artists techniques in the war. 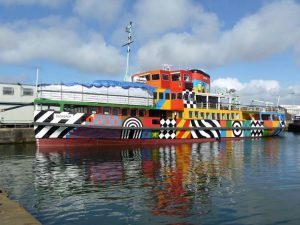 This incredible story served as inspiration for the next generation artists, who in remembrance of this event, created modern “Dazzle Ships”. It is a peculiar way to remember the WWI and study history for the community. This really broadened my horizons of understanding, it is simply amazing that people could come up with such a way to cherish the memory of such a gruesome and melancholic event in history.